Passion for food, family, friends and life! And there's no better place to do so than at da'Vida. 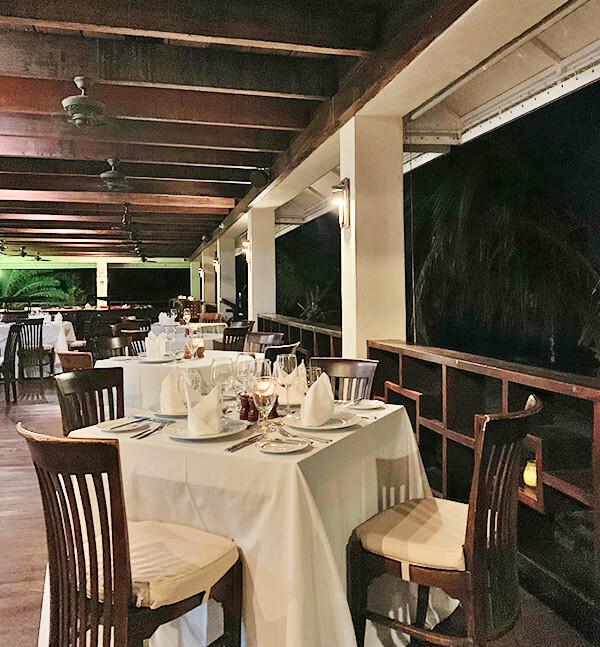 Whether you're having a casual lunch at their Bayside Grill (right on the beach and complete with lounge chaises and water sports), or an elegant dinner or tapas at their main restaurant, experiences at da'Vida are special. Special Tip: daVida now offers a nightly Shuttle Service. When you make your reservation, just notify the staff where/when you would like to be picked up and they will arrange the rest! What makes a high-end restaurant succeed? A combination of an excellent and unique experience and of course, superb food. And on those scores, the newest entry to Anguilla's luxury restaurant list, makes it the most important addition to the island in years. 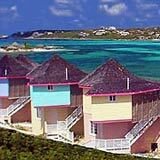 ... a lofty, open-air, wooden building, with charm and class, plush cushions and fine fixtures. 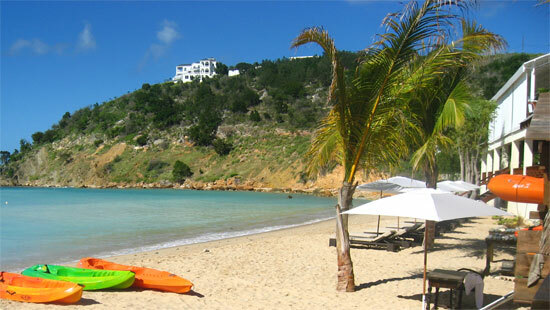 Instead of being on a crowded beach in St. Barts, you are on the soothing, secluded Crocus Bay in Anguilla. Da'Vida is the only structure on the whole stretch of sand. 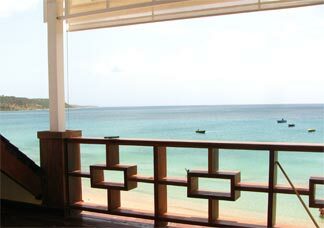 The restaurant is Anguillian owned, built on family land. It was once leased to the English pub, Roy's Place but today, the Lloyds (from Lloyd's Guest House) are realizing their dreams. 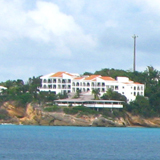 The late David and Vida Lloyd started Anguilla's first hotel, the Guest House, in 1959. 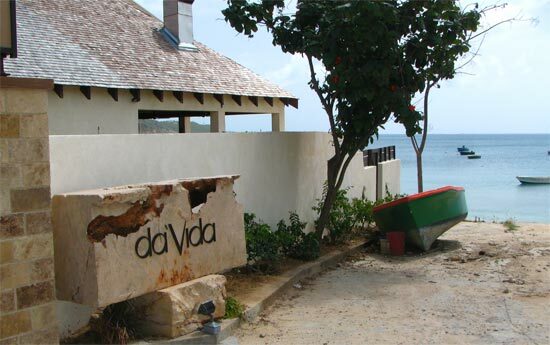 Fifty years later, their son and daughter, David and Vida opened da'Vida (David-Vida). 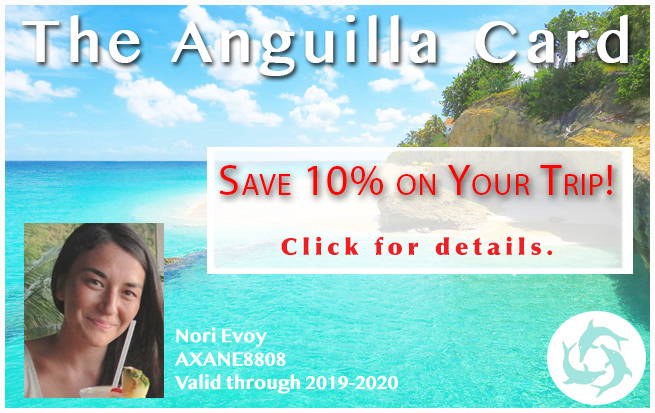 Their passion and purpose have turned this into one of the most exquisite restaurants Anguilla has to offer, set, picture-perfect on one of the most serene bays. Construction began in 2008 and moved quickly! I remember docking on the shores of Crocus Bay during a sail, wondering what this building would become. It wasn't built to be a hotel. It seemed too large for a restaurant. Maybe a villa? Now we know that this 17 000 square foot structure is more than a restaurant. 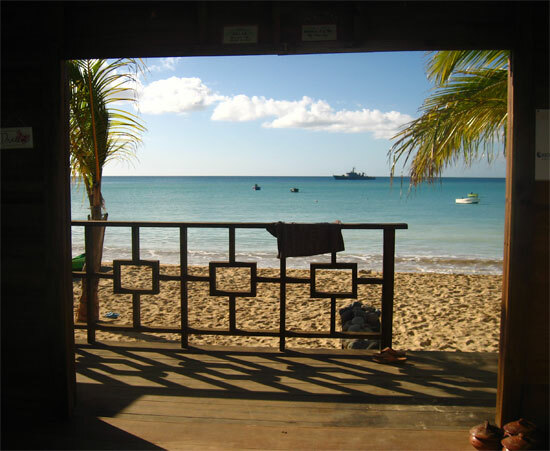 It is a place that allows us to enjoy Crocus Bay from a beach chair in the late morning, float and swim in Crocus' calm waters in the afternoon, and enjoy lunch, tapas or dinner and even host wedding receptions and business conferences (on the second floor). 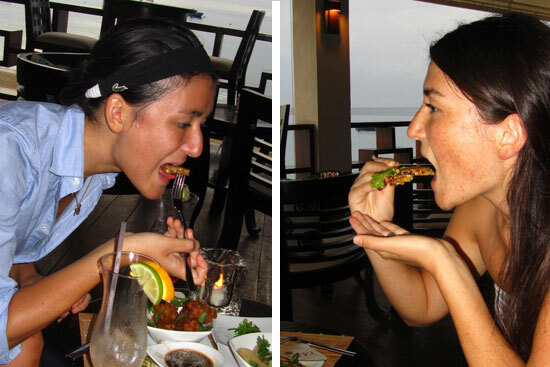 Click here to read more about da'Vida's tasty tapas that are getting high Anguilla restaurants ratings. We first tried da'Vida for dinner. Our very best friends from Montreal were visiting us for the first time in our new home. They were only in town for a few days, but it was a special trip and we wanted it to come to a close on a spectacular note! 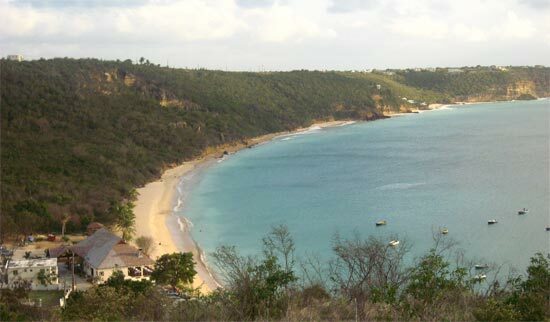 From the moment our car made its way down the steep, picturesque road to Crocus Bay, we were mightily impressed. We were greeted by a luxurious entrance and valet parking. 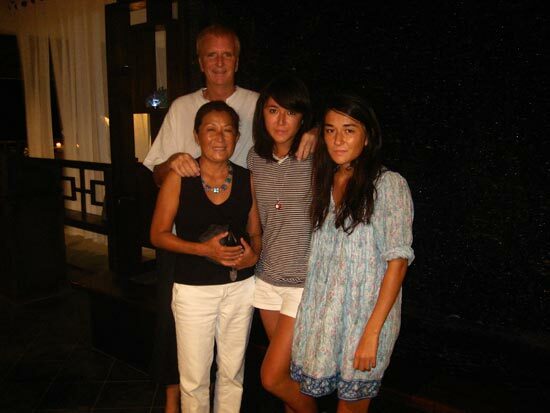 In the picture we are standing in front of an impressive stone water wall (see photo to the right). 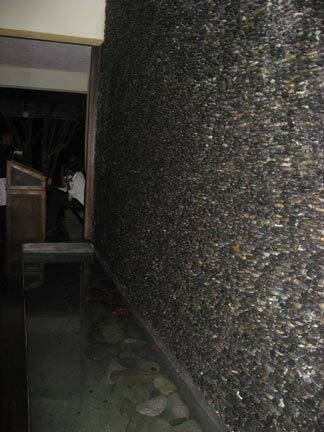 Water trickles down each stone, into the pond below. We followed our senses, along the stone water fall wall, making our way to the hostess. 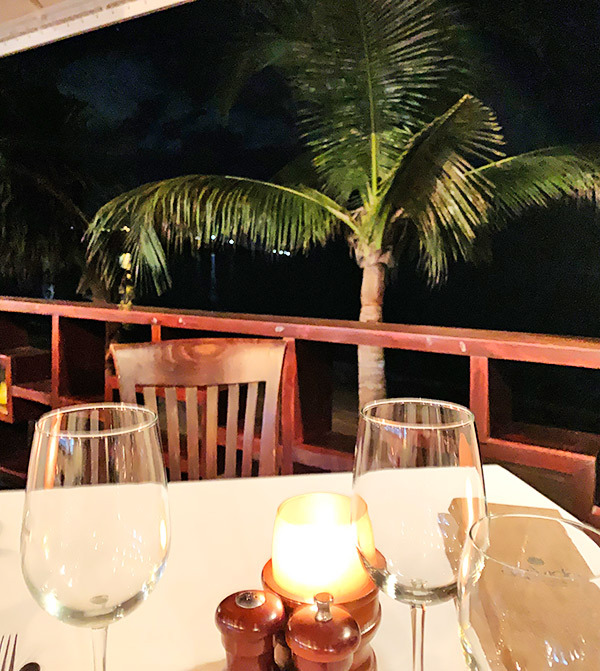 This was certainly a luxury Anguilla restaurant, so far, without any pretentious undertones, and only the warmest hospitality! When you enter the restaurant's dining area, you will discover a massive, yet intimate space, open to the outside, Crocus' waves gently lap. There are two areas: on the left is da'Vida's bar and lounge space, on the right is the dining room. Da'Vida had specially arranged our table that night. Our kind and vibrant waiter set up space for six against the water (something they do not normally do!). 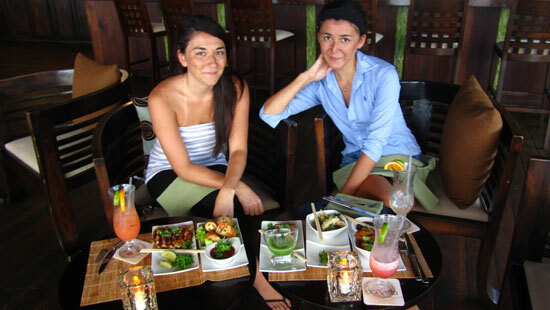 We sat cozy in our comfortable chairs, at our large white cloth tables and scanned the menu. Appetizers include: Ahi tuna tartar, lobster spring rolls, crab cakes and a wonton soup. Entrées include: Pan seared snapper, grouper, Katouche crayfish tails, charbroiled angus beef tenderlion and truffle mushroom risotto. Order placed, we sipped on our drinks and munched on warm breads straight from the oven. This would be a memorable evening. In good time, appetizers were served. Our friends loved the crab cake, and my Dad wouldn't even give me a little bite of his lobster spring roll. Hmmph! 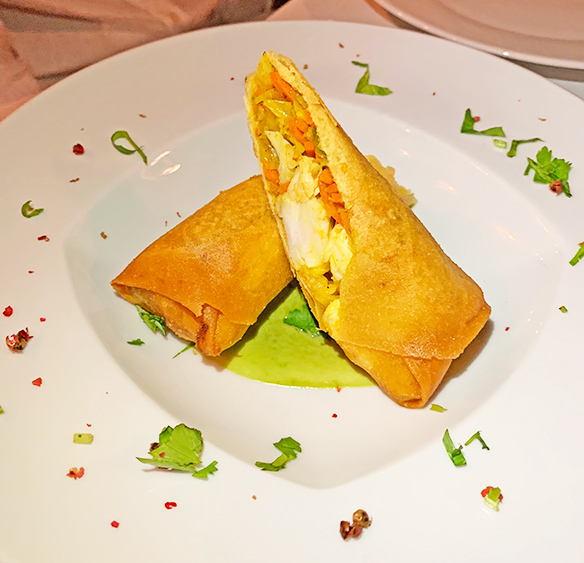 This is THE best lobster spring roll in Anguilla. Large chunks of lobster are wrapped up in crispy spring roll skin. It is all served in a basil cream sauce. Simply, the best. This is one of the most visually impressive dishes we have seen yet. 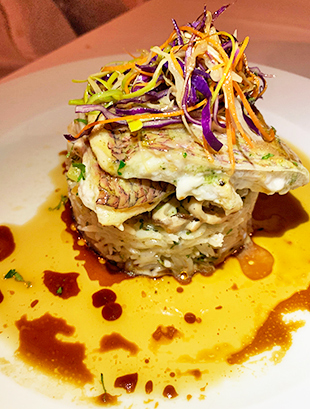 Snapper is seared to perfection in a soya jus. It is served atop Basmati rice and a mushroom and leek ragout. "The best steak on the island," my Dad proclaimed! 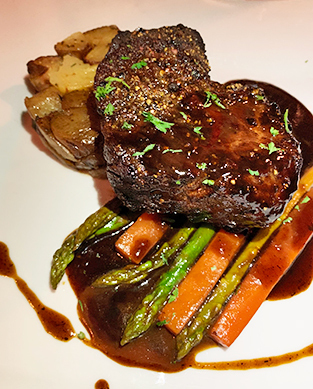 Steak is cooked to your liking and served in a teriyaki beef jus. The dish comes with crushed new potatoes, carrots and asparagus. No one had any complaints, only cries of joy. My Dad's friend Bob has owned high end restaurants. He is not easy to please. Even he fell in love with da'Vida, noting that the food is outstanding, the experience to die for. 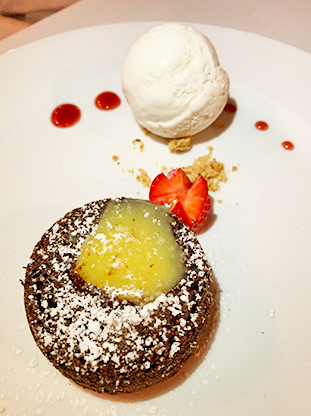 The night came to an end over coffee, lava cake and warm apple tart. 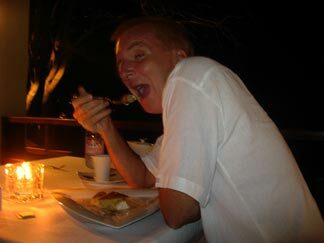 My Dad looks like Popeye in that picture, but he is thoroughly enjoying his dessert! The lava cake was equally successful! It was a magnificent meal, and a very special end to a very special trip! We couldn't have wished for a happier ending. 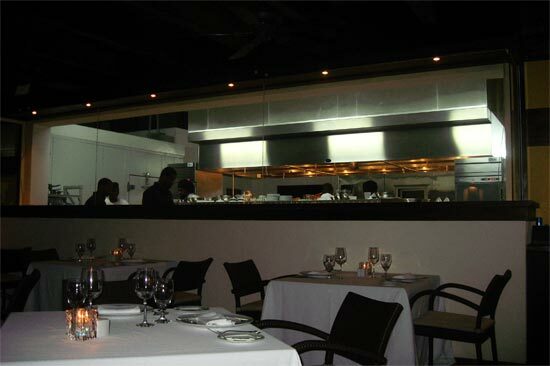 It is expensive, but perhaps one of the most high-value fine dining experiences in Anguilla. It is worth every penny. Da'Vida serves dinner from 6:00-9:30. In between lunch and dinner? da'Vida serves a full tapas menu from 5:00-9:00. My Mom and Dad were the first to try da'Vida tapas menu. They sampled the spring rolls, cod fritters and chicken satay. They both said this is a wonderful way to eat reasonably inexpensively, enjoying the sunset and the surroundings if you're not in the mood for a full dinner. We have returned for da'Vida's tasty tapas several times. They have expanded their menu, and now offer several excellent Caribbean-Asian fusion mini-dishes. From the delightfully delicious tapas, to the cool drinks, to the jazz music coming through the speakers, to the luxurious-relaxing atmosphere... the da'Vida tapas experience is not to be missed! More on da'Vida's tasty tapas. Da'Vida has a unique blend with their location, service, ambience & food. One of our favorite of their additions? 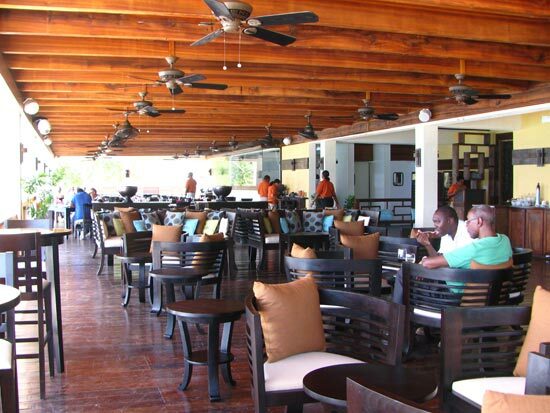 Just next-door to their luxurious and lofty main restaurant lies da'Vida's Bayside Grill. 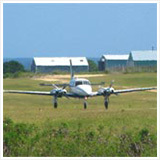 Delivering a five-star, luxurious beach day at a very reasonable cost. da'Vida's Bayside Grill has perfected the recipe to provide the ultimate beach day. First, you just can't beat their sandy beach front location. You can even eat on picnic tables, right on the beach, toes in the sand! Second, their lunch menu is the tastiest, prepared with the freshest ingredients. 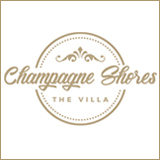 They offer a variety of beach classics, including salads, burgers, sandwiches, wraps, and large entrees including BBQ chicken, ribs, grilled fish, steak and crayfish or lobster. Finishing off the last sips of your rum punch is best enjoyed sea-side, from one of da'Vida's comfy beach chairs, their wide umbrellas shielding you from the strong, warm Caribbean sun. The beach also has a nice, bobbing floating dock that is fun to sun on (the waves gently rocking you) and jump off of! If a lazy beach day isn't for you, if you prefer a more active day at the beach, da'Vida has you covered. 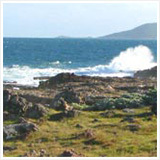 Renting a sea kayak, and paddling to quiet and protected nearby Little Bay is a fun voyage. Don't forget to bring a water bottle! We forgot to bring one, and Dad was parched by the time we arrived back at da'Vida. 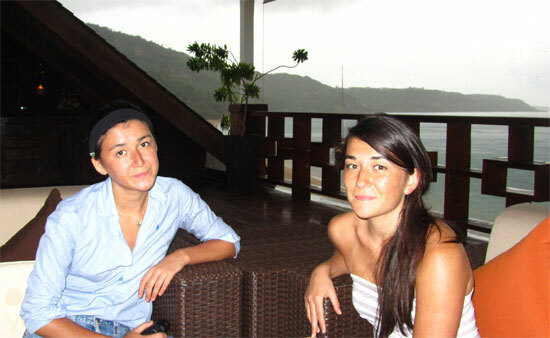 For more on da'Vida's Bayside Grill, click here. 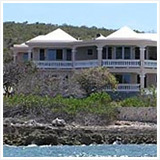 With such beautiful facilities, it is no surprise that da'Vida has been booked for several weddings and various affairs. 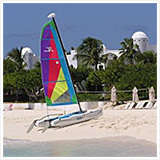 An Anguilla wedding here, in da'Vida's tranquil luxury setting, must be pure magic. 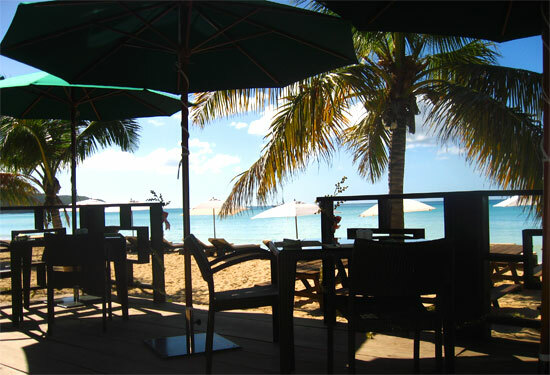 Da'Vida is an Anguilla favorite, so be sure to make reservations for dinner. 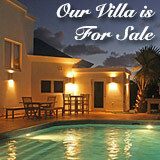 Da'Vida is truly the finest luxury Anguilla restaurant. We have never returned to a five-star restaurant three times in the space of a couple of weeks, but excellence is the exception! In this case, that is da'Vida. 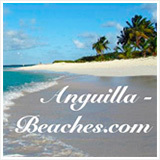 Do not miss this luxury Anguilla restaurant on your next visit. 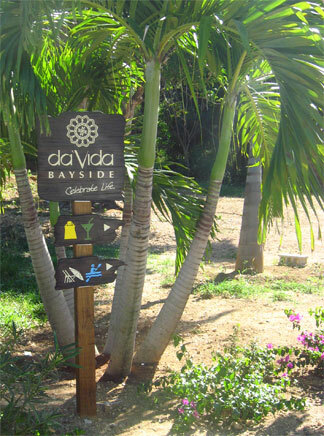 Directions: Da'Vida is located on Crocus Bay, just 2 minutes from The Valley. 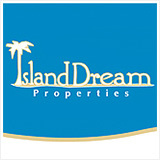 Good for beach days and lunch, elegant tapas and high-end, serene dinners. Lunch at Da'Vida Elegant daytime dining at da'Vida. 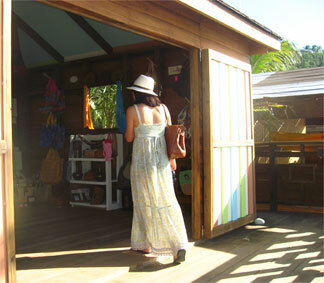 If you prefer are lounging on the sand, there are two cute shops to poke around in. da'Vida's gift shop has many sweet da'Vida souvenirs, from beach bags to t-shirts. 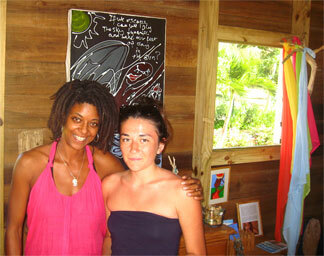 Located next door is Why Knot, one of our favorite Anguilla shops. 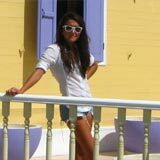 Why Knot is owned by Fabiana Liburd, a creative lady who is a pleasure to chat with. She designs all of the original pieces featured in her shops, breezy linen wraps and beach cover-ups that come in an array of fun colors. Don't miss Why Knot on your da'Vida Bayside Grill beach day. After the shopping, the kayaking, the napping, the sunning, the dining and drinking, Dad will usually initiate a relaxing beach walk down to the far Western end of the beach. You just may find a special souvenir for free. Many pretty shells wash up on that end of the beach, especially after a big rain storm. This area is primarily reserved for receptions, weddings, baby showers, or any event you may wish to host. 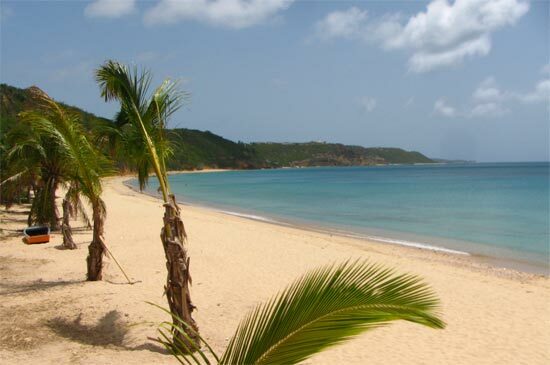 It is beautiful and airy, with the most expansive views of Crocus Bay, catching more of the warm winds. Yuki's personal favorite are the Caribbean corn & vegetable fritters served with a spicy black bean sauce. We usually order 2 dishes per person and share, so we can get a little taste of everything.